Hello again all! In my effort to catch up on things that have happened while I was overseas, I now turn to the the any episodes of GOT that have aired in the past few weeks. Needless to say, their were some rather important ones, and ones which I was eagerly awaiting after last season’s bloody and brutal ending. And since I am several weeks behind, I think we can dispense with the usual spoiler warnings and I can say that I was really looking forward to seeing Joffrey die! The episode opens with Ramsay Snow and Miranda hunting a young woman in the forest with Theon Greyjoy (who now answers to the name of Reek) following in tow. After chasing her down and putting an arrow through her leg, Ramsay’s dogs eat her. 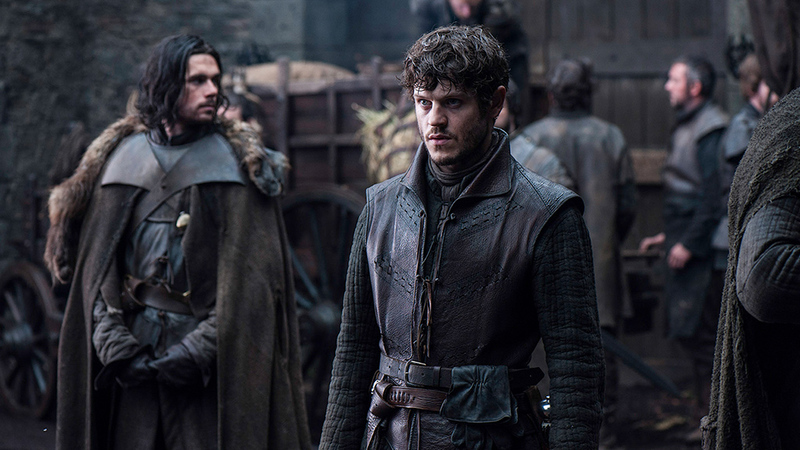 Shortly thereafter, Lord Roose Bolton returns and chides Ramsay for his behavior. He learns that Bran and Rickon are alive and that they be found, and orders Ramsay to ride to Moat Cailin to take it from Asha. Back in King’s Landing, Tyrion meets with Jaime for the first time since his capture and comes up with a solution to his left-handed problem. Since he needs to train again in the use of a sword, and desires a trainer who will be discreet, Tyrion pairs him up with Bronn. Tyrion meets with Varys and once more discusses getting Shae out of the capitol and to Pentos, which has become necessary now that Cersei’s spies have identified her and both she and Tywin know of her existence. The preparations for the wedding continue, and gifts are being conferred on Joffrey from all the houses. Tyrion gives him a copy of the rare book The Lives of Four Kings, which Joffrey reluctantly accepts. Tywin’s gift of the Valyrian sword is next, which he uses to chop the book to pieces. Shae comes to meet him afterwards and Tyrion tells her that arrangements have been made to send her away. She resists, and Tyrion is forced to be brutal with her and tells her she’s a whore and can never bear his children. 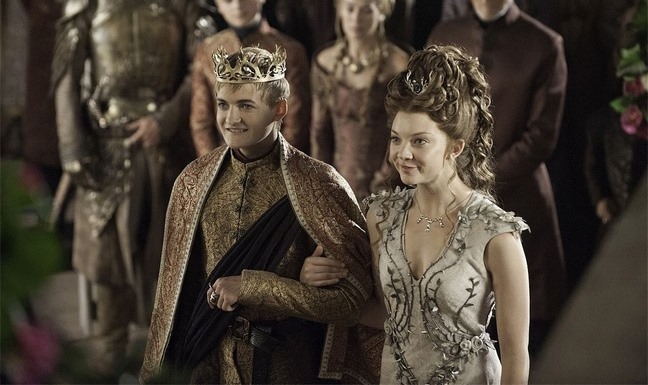 Next day, Joffrey and Margaery are married in the Grand Sept of Baelor and the wedding feast follows. 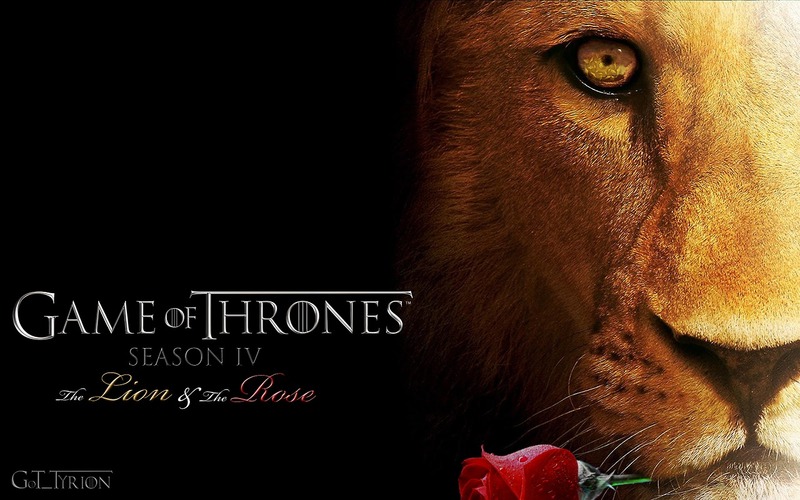 The usual machinations and posturing take place – between Jaime and Ser Loras, Brienne and Cersei, and especially between Prince Oberyn, Cersei and Tywin. Joffrey begins acting very abusive towards everyone, and then summons a group of dwarfs perform a terribly offensive rendition of the War of the Five Kings. He then directs his abuse at Tyrion by pouring wine on his head and forcing him to become his cup bearer. To distract from the display, the pigeon pie is brought out and both Joffrey and Margaery take the first bites together. Joffrey orders Tyrion to fetch him wine, drinks, and is then begins choking violently. He dies pointing at Tyrion, who is then arrested. In the confusion, Ser Dontos hurries to Sansa and tells her to come with him if she wants to live. To the north, Bran, Hodor and the Reeds continue their trek to the Wall. Bran has a greendream where he is inhabiting Summer’s body and the Reeds wake him and warn him that he could lose himself if he does it for too long. They come across a weirwood, Bran touches it, receives visions, and hears a voices saying “look for me beneath the tree” and “north”. Bran awakens from the vision and tells them he knows where they need to go. Obviously, this episode was quite satisfying for all concerned! 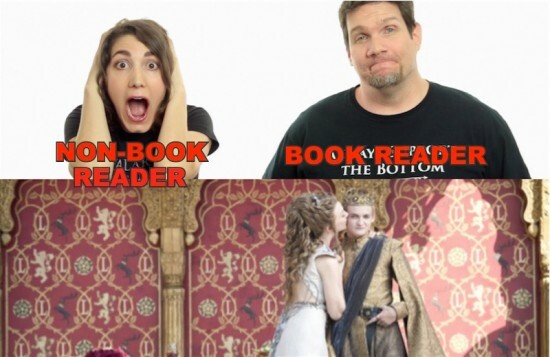 For those who have not read the books, it was a real shocker and nice way to balance out the trauma of last season’s Red Wedding. 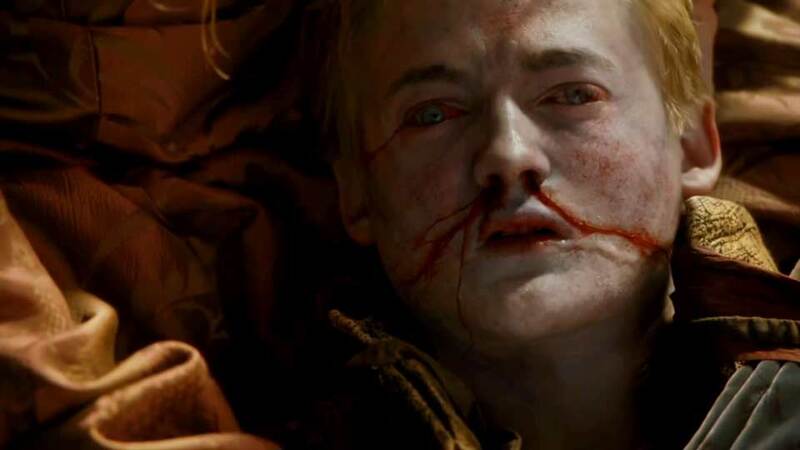 For those who have, it was a chance to see the poetic justice of Joffrey’s death beautifully rendered. I for one loved what they did with it, both in terms of Joffrey’s terrible behavior leading up to his death, and then the way he died horribly. In addition to being true to the text, it was artfully one and very well acted! As for everything else in the episode, what we got was mainly pacing and filler, and some changes which stuck out for me. For one, Jaime’s attempts to learn to fight with his left hand did not involve Bronn as his teacher. In fact, he sought out Ser Ilyn Payne for that job, mainly because the man has no tongue. Bronn at this point was far away, having been bought off by Tywin with a title and sent off so he couldn’t help Tyrion anymore. Second, Shae was not sent away at this point. Though it was clear that Cersei had learned of her identity, Tyrion thought she was safe since Cersei had nabbed the wrong “whore” before. This, as we shall see soon enough, came back to bite him in the rear. And again, the material from Dragonstone and the Dreadfort felt like pure filler. But since we haven’t heard from these characters, I guess they felt the need to give them some screen time. Other than that, the episode was a long time coming and I enjoyed it thoroughly! Onto episode Three – Breaker of Chains – and another long-awaited part, which is the seige of Mereen!